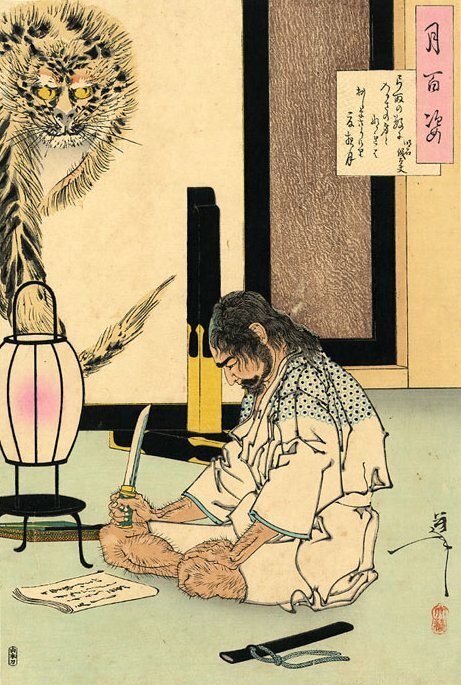 The concept of Seppuku is so ingrained in the culture and psyche of the Japanese people that, as a western writer, you cannot expect to be able to write believable Japanese characters while it remains abhorrent to you. I remember when this occurred for me; it was a combination of “a moment of satori” with the realisation of a satirical attack—beginning with an “aha” and ending with me choking on the thought as the illusionary barriers that my subconscious had used to hide, and possibly protect my mind, from the truth. It was while reading a novel set in feudal Japan – loosely based around the Forty-Seven Ronin. With many concepts that I have encountered in philosophical and martial arts studies it cannot be taught or learnt in isolation it can only be transmitted at the intersection of two minds, with the greater challenge for the recipient; it almost becomes them discovering the concept anew. This entry was posted in Change, Collaborating, Learning, Life, Philosophy, Satire, Writing and tagged Japanese, Life, Philosophy, Point of view, Satire, satori, seppuku, Writing. Bookmark the permalink. That’s an interesting point. If you’re missing a crucial part of the culture of the character you’re writing, the character loses something as well. Yes I agree. For an observer sometimes the crucial points may be overwhelmed by the flashy, larger than life ones. I found in my Aikido training/studies that it was often a small obscure movement that was the key to a technique – one that would never be noticed by a non-participant.